In early July, Nestlé Waters France sold off two of the three bottling plants operated by its subsidiary SFER (Société Française des Eaux Régionales or French Regional Water Company). Workers employed by Nestle Purina in the State of Sao Paulo, Brazil have had enough of inferior wages and conditions. 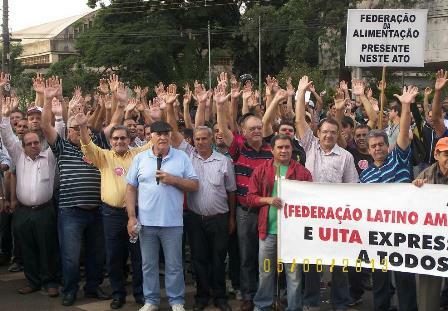 The food trade unions of Sao Paulo (FETIASP) are in the midst of a round of collective bargaining with employers. Members of the Moroccan Union of Workers (UMT) at Nestlé Morocco march through the streets of El Jadida on May Day. After a long and difficult struggle for basic rights - fought together with the entire IUF - the Nestlé Panjang Workers Union has now successfully negotiated a new CBA. Nestlé has reported its slowest sales growth in three years, blaming weak demand in Europe and slowing demand in emerging markets. A year-long union struggle on behalf of temporary workers at Nestlé Purina PetCare in Euskirchen has been crowned with success. In September 2012, all workers on temporary contracts received permanent contracts, new permanent jobs were created and 3 long-serving subcontracted workers were hired on directly. Neuselters mineral springs is under threat of drastic job cuts: if company plans are carried out, 40 out of the 74 employees currently working there will lose their jobs in the 1st half of 2013.